This is a training day consisting of White Water Safety and Rescue Skills run by AOAC club coaches. 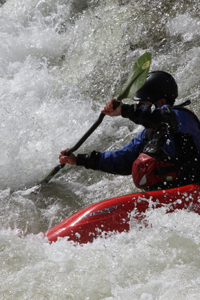 This is the next step up from the AOAC's Moving Water Safety and Skills course and is ideal for anyone looking to paddle on any of the club's White Water trips, as it will greatly increase your confidence and competence in Moving Water situations. Swimming techniques in moving water, including swimming in and through white water features. You must be at least of BC 2* kayak standard and have completed the AOAC MWSS course. Ideally you will have some experience of white water grade 2 or above. Please contact the organiser if you are unsure if the course is suitable for you.